Save Zombie is the new escape game from ajazgames. 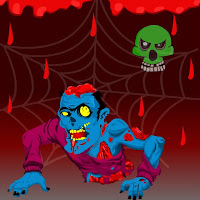 Here let’s play a new level of game , you are gonna to save this zombie, there are number combinations, clues , puzzles, memory move , some objects has to be tried randomly to unlock the clue or solve the puzzle. I am sure you will have freaky fun playing saving zombies. Good luck, hope you are safe. Fun playing new point and click games.